As you can see, they all came up with something unique and the jars make very beautiful candle holders. As before, roll out some black fimo and cover the jar, blending the cracks to make it smooth. Ten cut out shapes in the black and gently remove the piece, replacing it with a translucent piece instead. Use a pencil to make holes through to the glass and fill with balls of translucent clay. A clutch of these on the Christmas dinner table would be a beautiful, memorable table decoration indeed. Yet another perfect use for baby food jars! Photo credit for my lovely friend at Le Ciel Rouge. Last week Maddy had a go making candle holders in Hama Beads, using jars and colours to reflect the changing seasons. You can see her efforts here; they’ve already been getting a good showing on Pinterest and I think they were very innovative. Naturally I wanted in on the act as she inspired me to try using some of the special effect Hama Beads that have come out in the last couple of years. These are made from red, silver or gold hama beads in the bottom of the jar. Then I added pearl hama beads mixed with clear ones and topped them with the same colour as the bottom. I had preheated the oven to 180c and popped them in for about 10 minutes. I kept an eye on them and pulled them out once they had melted just enough. The pearly beads really glisten and the clear ones add a sparkle too; they look a little like snow and are very effective. One important thing to do is take them out of the oven carefully while still hot and press a tealight holder into the top to flatten it. However I’ve since found that pouring water and a little bit of white glitter into these adds even more sparkle and of course the water keeps the candle base cool and allows it to float on the surfaces lightly. Full making details are over on BeadMerrily, where the original version was featured. Here is a quick and fun way to use up the strips of crochet you accumulate when a child is learning that craft.My 10 year old actually taught me to crochet, but is still happiest turning out long chains. I got her to do a long piece in bright orange acrylic wool for me, so we could make a pumpkin pot using some glass baby food jars we have stashed. As you can see, he turned out really well. It’s so simple; one long chain of yarn, crocheted in orange. 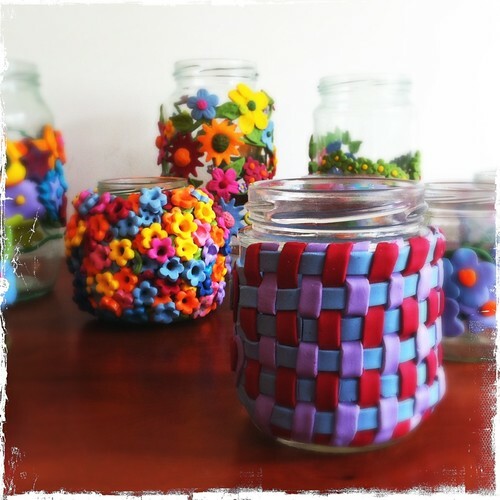 Then paint a jar in tacky glue and wind the crochet around the jar. We did felt shapes for eyes and nose and mouth in yellow, but I think for a quirky effect, we might replace them with black tomorrow. The felt got glued on too. For a bit of fun, Amelie covered the lid of the jar in green fimo to give him a top. She decided it turns him into a French pumpkin! If you use an electric tea light for the glow effect, you’ll be able to leave this lid on while he’s ‘alight’ – obviously with a flame tea light, the lid will make him go out though! For the record, we put a flame tea light in. The yarn is synthetic and can’t burn easily. I lit it once the candle was inside (grown up job!) but you could flame proof the yarn if you wished. Be careful – and don’t do anything silly with it. We aren’t responsible for anything daft you do while making or lighting this craft! Sometimes when I’m trying out a new idea in Fimo, what I like to do is have a go at a very simple version first and then see what I like and don’t like about it before I go on to try a more complex version. Family life does tend to mean that I never get to the complicated version, or I don’t ever blog what I do make because I’m not happy with the finished product! In fact this blog is partly for exactly those projects; things I know someone else will probably do a better job of than I will but might not have had the particular idea in the first place 😉 This particular project started off as a quick try out of an idea though and when I test ran it, I liked it far more than I thought. So I give you a simple Fimo Autumn themed votive, which looks LOVELY when lit and pretty good when it isn’t too! The original plan for these autumn jars was for them to be complex, similar to the flower jars we made on recycled jars early on in the summer. I wasn’t feeling terribly creative on the day though and just made some simple oak leaf shapes using an icing sugar cutter and some branches that looped around the jar so it would all hold together. Then I decorated it with some very simple acorn halves and baked it, feeling rather disgruntled with my efforts. These were the things I wanted to do better. 2) Use texture plates to make more realistic leaves and make them thinner and less chunky. 3) Look more closely at acorns and learn how to make them in polymer clay. 4) Build up the base with more detail to hide the tealight. I’ve created several Pinterest boards to develop the theme a little more including a Hedgerow theme and Autumn Crafts and Nature Crafts and I think I’ll be back to working on this, because autumn colours and shapes really please me. However, in the end, the way it looked in the dark pleased me enough to think it deserved a little outing even in its first incarnation. Following on from the success of the flower Fimo jars last week, I had an urge to try out rainbows on jars too. I had an idea in my head of a candle votive decorated in coloured spirals and thoughts it would be fun to experiment with a few designs on some small jars. I quickly found that Fimo Classic or Sculpey Premo was the best type of polymer clay for this; while Soft clings well to the jars, it is too hard to get a neat rope from it. I’ve not done a lot with Premo in the past but I suspect I’ll be coming back to it as I really enjoyed working with the purple colour I used. Fimo is ideally suited to quick rainbow making as it comes in the perfect colours, so no mixing required. The only blending I did was to make the slightly more muted leaf colour on one of the jars, otherwise these are straight out of the packet. My first attempt was the one second from the left, which is fine but I rushed and wasn’t too pleased with. After that I remembered seeing Starless Clay on Etsy once, so I had a look at her for inspiration. I adore her work and am hopelessly jealous of her talents but I used her for inspiration (I hope she will be flattered not annoyed!) I didn’t attempt any of her fancy filigree or marking of the spirals but did cut chunks out of my spirals with a circular cutter and fitted them together that way. It was surprisingly easy to do that, I can’t work out if I’m naturally talented with circles ( ;)), lucky or there is some circular mathematical magic going on I don’t understand. After that I used some other small sized cutters to make a random jar covered in geometric shapes to see how far you can stretch the requirement for the Fimo to loop around the jar to hold it all in place. It did work but one of my girls broke it before I varnished it to make it stronger. Fun though and a design I will probably come back to. Last up was the flowered one; I just loved the rainbow palette of colours for this, it really seemed to work in a perfect, natural balance. The flowers and leaves could easily be made by hand but I stuck to cutters for speed and a uniform look to it all. It’s given me an urge to try some crewel style designs in polymer clay. Lastly, Maddy stuck much more firmly to the rainbow brief in her version, which is a change jar decoded with a rainbow (and blue bird) and a photo of her when she was little. She’s going to do a step by step blog post on how to do this soon. So this week I had to provide a craft for children in a group we go to so I took jars along with us. I also took the flower cutters I have (made for icing) but I’ve blogged before about hand making fimo flowers, which is just as interesting? As it happened, the kids made as many of their own flowers as they cut them out and were very creative. Amazingly, they spent all day poring over their creations and as a craft it worked brilliant, especially for using up scrap polymer clay. The results were stunning. The premise is really simple. Polymer clay will hold to glass around a shape so long as there is a continuous loop. The clay bakes and contracts and so a loop will grip on to the jar. You can varnish for extra stickiness and gloss and strength to the pieces but it isn’t necessary. The kids built up designs of looping stems, leaves and flowers to make vases, candle holders, pen pots… You name it. The front left one, while clay intensive, has holes pushed to the glass in every flower to let candle light out afterwards. The kids all interpreted their designs in their own way and as you can see, my Maddy did her very own thing again! I can see us coming back to this idea again and I’ve been collecting some inspiration of my Fimo Pinterest board.